Lesvos, also known as Mytilini, is one of the four largest Greek islands. It is lying in the northeastern Aegean Sea across the coast of Asia Minor. The land of Lesvos which comprises 1698 sq. km. is the result of volcanic eruptions and it is anomalous and stony with a lot of mineral water springs. The variety of its land (mountainous, flat, valley like etc.) creates a respective variety of landscapes with contrasts such as the simple pleasantness of the eastern coasts and the wild mountainous magnificent landscape of Lepetymnos in the north, the abundantly wooded slopes of Agiassos and the forsaken loneliness of the geologically disturbed southwestern area around Sigri. Vast olive groves, dense pine forests, sandy beaches, monasteries and traditional houses compose the first impression that enchants the visitor. This is an island with a long history - homeland of Sappho the poetess, to Arion the guitar singer, to the musician Terpandros - which today continues its tradition by producing first - rate names in painting, poetry and literature. Due to its mild and healthy climate with its temperate winter, its many rainfalls, its bright spring and sunny summer, Lesvos is a very productive island. The fishing industry is also very developed (Kalloni's salted sardines are famous). Largest city and capital of the island, Mytilini, which is built on the eastern coast on a low land neck which connects a hill with the mainland thus forming a peninsula. 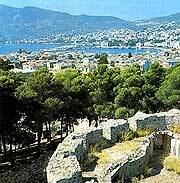 In the ancient times this peninsula was an island which was the acropolis of Mytilene along with the castle. It is built on the ruins of the ancient city and extends amphitheatrically along the coast. On the pine-clad hill, the castle looks as if it were protecting the city. 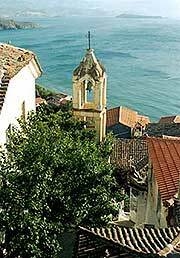 Mytilini is also the capital of Prefect of Lesvos (the islands of Lesvos, Limnos and Aghios Efstratios). The city has two harbors. The southern one for the large ships and the coastal communications and the one in the north for the smaller vessels. Along the quay are many modern buildings and hotels (which provide all modern comforts). The city of Mytiline has a very interesting Archeological Museum which houses findings of all eras. Most important findings are copper, marble and clay idols; one of them belonging to the prehistoric ages. It also includes remarkable finds, e.g. the "Lion of Gera", the marble throne of Potamonos and a "Statue of a Woman", of the Classical period. Further Mytilene has a museum of "Popular Lesvos Art" and a Library with many thousands of classified volumes and some rare books and old manuscripts. 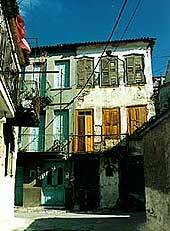 At the "Lesviako House" visitors will notice replicas of interior sections of the Lesvos homes during 1800-1900. The visitor can enjoy walking through the wonderful municipal garden and its charming environment or on the coastal road. It is worth visiting the prominent castle which was built by the Genoese on an older Byzantine one (6th century). In the northwestern hill of the city there are ruins of a Hellenistic theater (300-100 BC) with an excellent architectural construction. Mytilini is a beautiful town, especially when viewed from the sea coming in on a boat. There is an architectural mixture of old and new elements with streets surrounded by trees. The town is decorated with several parks. The commercial center is alive with banks, shops of all sorts and travel agents. The "Town Theater" was built in 1952 and seats 756 persons and is basically used for cinema, showings, cultural events, congresses, seminars etc. In town one can find a wide variety of hotels, rooms to rent and the ability to sign up for tours to other areas of the island. there are also many outstanding tavernas, restaurants and bars. Traditional houses are found in the Aklidiou, Halika, Sourada and Kioski areas of the town. There are a number of nice beaches near the town, including Kioski, Fikiotripa, Neapoli and Kratigo.